I'm getting back in my old groove again. 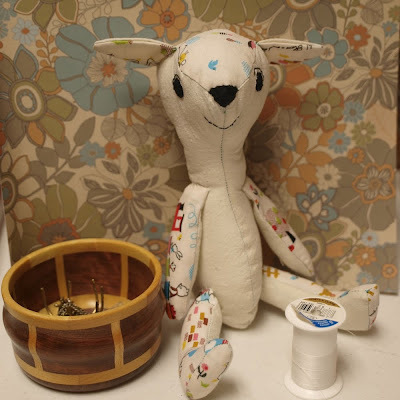 I sat down last night and cut out a 'sample' pattern from scratch for this little guy. Originally supposed to be a kitty - kind of looked like a bear, but upon seeing the pictures of it Esme said 'white doggie!' She also tried to put a dog leash on it and drag it off but I didn't let her. It is safe in a mailing box waiting for a new home and new adventures to go off to. Decoration only, stays sitting up position 9 inches tall. Hand embroidered face with black thread and black felt eyes and nose. I caught this little montage of Esme this morning playing with her playdough. I couldn't choose between them.. so put all three together. She is wearing the choo choo pants (Train fabric) she was so insistent about. I love the way her hands move and the intent expression. Also last night we had a game of balloon baseball going on. Daddy was watching a zombie flick and Esme was very disinterested in it - which was good, in my opinion. She brought me a balloon and kept saying 'ready! ready!' for me to throw it at her, so she could smack it with the fly swatter and say 'I did it!' It was loud but cute. This morning besides using toys to stamp her playdough she and the kitty are having a loud fun time chasing superballs around the house. 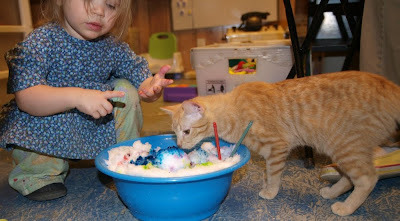 Esme will carry it in a plastic cup and then let it go - and the cat and her will chase it or she will just tell the cat No No No and then try to get it before the kitty does. I was going to work on that green dress again last night but it didn't happen... choo choo pants were demanded to be made. She chose the fabric and then when Mark was waiting for the pizza to cook she brought me over to the sewing table and said 'choo choo mama - peeeeez?' She used her 'I'll be sad if we don't' face on me.. so I cut them out and then sewed them after supper. While I sewed she drew with her crayons and kept an eye on the process. She wore them to bed and they were still completely dry this morning (wow) so she gets to wear them today as well. Laugh moment: Mark and I were visited by the little girl from the exorcist today - at least that is what Esme's voice sounded like when she pointed at the bag on the table and said 'I want a cheeto' loud and monster-like. I had the day off, and we went to town for a few things. 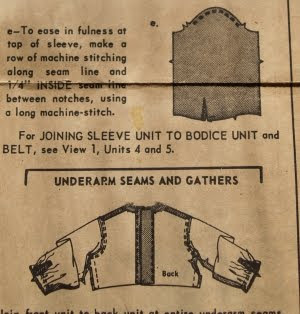 I had a mail pickup to get - a 1946 unprinted pattern for footed pajamas. Wow. This was before they printed and folded patterns. An actual person cut this pattern with scissors, piece by piece using some hardbody template - and then carefully folded it into an envelope with printed instructions, which someone else bought and stored for 70 years. Now I'm unfolding it on my desk, in close to perfect condition. Mind boggling. It does remind me some of the drawing paper and newspaper patterns I make when I am altering patterns or making them up -- except on an industrial scale. At the WM Mark went to look some movies while I took Esme around the fabric department. She identified horsies and kitties and birds and apples and bees.. and then fell in love with a choo-choo fabric. I have it in the washer and intend to make some pants out of it. 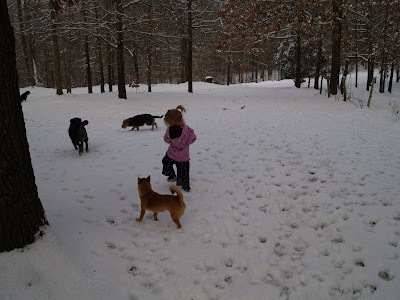 She has been insistent about seeing the choo-choo on Starfall lately as well... I was very surprised she put the horse and cat fabric down as soon as she saw the trains. Is this my Esme? I've worked on it for a few hours and it is looking good! I have the entire body finished and one sleeve in. The zipper is pinned in already. Handsewing the zipper, putting in the second sleeve and hemming all around the bottom and the sleeve wrists is on tomorrow's agenda. I'll then find out if I want to make the belt pieces or keep it as it is. It is BIG compared to the size 4, and would go down to her feet. WOW... the green against the print fabric is looking excellent. 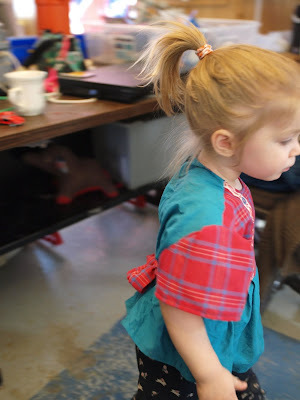 I went to Mockingbird Threadworks on Friday afternoon, and bought a few green fabrics to make Esme another dress. Yes, before I even put the size 5 together. What? Why? I really wanted another color green. I didn't need it - but I had the fabric itch.. to go and feel the fabric in person and compare colors. I had tried it online and just felt like I wasn't getting inspired or anywhere else either. Maybe I'm flaking out ;) The store only had a quarter yard of the fabric I really really liked. I bought another yard of something coordinating and hope I'll get a size 4 out of combining the two. The darts are finished in the front of the size 5 and I've been taking little scraps of blue fabric to work to make into cats on my lunch hour... cutting freeform and not following any pattern -- just to keep my mind active. Also on Friday Mark helped me take the sewing machine apart again and find where it was squeaking. I ended up cleaning it quite a bit again, too. It now runs without any squeaks... which is a little eerie considering how I've gotten used to at least some noise from it! Three in one oil is a wonderful tool. 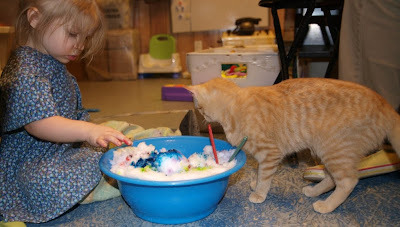 Esme had such fun playing 'tea' and petting the ceramic kitty at the store. Jean, the owner, was really genuine in her interactions with Esme. She talked to her and listened to her and showed her books and agreed things were pretty. Between Mark and Jean I actually took a breath and looked at all the fabrics I wanted to before making a choice - sometimes I usually feel I must rush and settle for something so as not to spend so much time... ie: give the toddler a chance to throw a fit when Mom's attention is elsewhere etc... you know how it goes. Mark and Jean talked with Esme and I wasn't afraid she would start getting into things she shouldn't under Daddy's watchful eye. It turns out Jean also did the hat monogram for the baseball hat Mark wears everywhere. She worked years ago at the store that made the specialty monogram - and still had a copy of it in her computer files... *whoa*... I guess unique makes for memorable. I feel bad I won't go more often to the store to buy - especially since it is right there in Huntingdon. She does carry more 'seamstress' and children's designer fabrics than the other quilt shop in Camden does. That is the main reason I've been there three times in a few months... and do plan on returning, but only when I really get the itch to touch, compare and find a fabric I can't get anywhere else and don't want to wait for/pay shipping. She has a small shop, but definitely a treasure and one I hope stays in our community. This is the progress on the green size five dress - which will be large enough when it is done that Esme will actually have to grow INTO it. I know I should make another size 4... and I've actually made two of them already, so this is a case of me just wanting to dive into the new thing! As I look through it I realize it isn't entirely 'new'... In many ways, this pattern is just like the size 4 (1975) dress I made. But there are several different elements in it that peak my interest. First off, it has darts on the front center - right at the belt attachment. And then the sleeves are much stranger... posted a few little picture of them here. The one thing I worry about right now is that the collar piece of the pattern is missing... but can probably be made up if I think it is necessary. The belt pattern piece is missing as well -- but I never use the actual pattern for that piece as it is. Esme in her blue dress, the size 4 that already has some 'growing room' in it. (So you see why me making a size 5 right now is very early!). She is playing with the check writing machine and eating her orange at my sewing table. 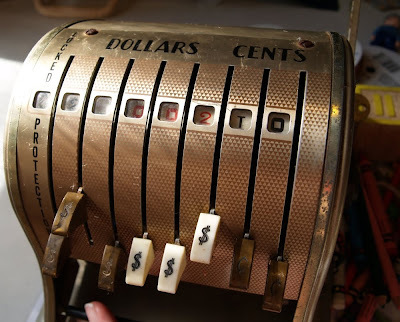 The machine is an antique with lots of number slots that move like a combination lock and a big lever she loves to pull on. It still imprints on paper but there is no ink in it. We bought it at the flea market for 10 dollars last year and she loves it. 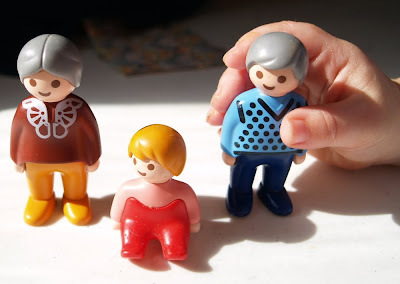 Also she loves to play with her 'grandma' and 'grandpa' and 'baby' playmobil characters. She will grab the phone and put on a play about going to see her grandparents. The snow from the other day is nearly gone - but they say we may get more over the weekend. I worked very early yesterday and have a late shift today. In between I have a terrible headache..trying to get rid of it. Esme is playing with her Playmobil family and hugging the cats until they run away. Esme watched Curious George and then fetched her 'zip-zip' jacket that has George on it and tried to feed the picture on it some chicken. Coffee made the headache somewhat better - but more sleep would have made the late shift more manageable tonight. As it is I am very very tired. Esme went to see Grandma and Grandpa for a little bit, and now soon I have to go into work. 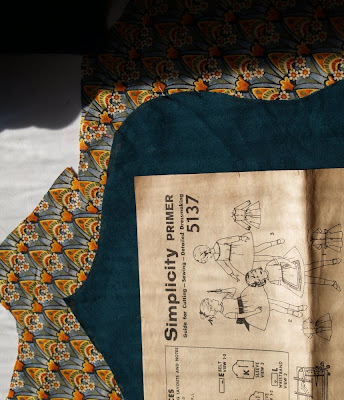 I've gotten the dress pieces cut out for the 1960s dress size 5, some pretty bottle green and an Egyptian like print with daisies in it.. has to be seen to be understood. I'll have to iron the pieces better tomorrow and start to work on it, unless Mark decides he wants to go out to one of the towns. The front of the dress is more complicated, several darts and also several gathers on a much different kind of sleeve than I'm used to working with. I know this dress, when finished, will be much bigger than the size she is wearing now... which is also just a tad too big for her as it is. But it's better to grow into something than to have already nearly grown out of it by the time it is finished. I was going to work with some other blue cloth - but Esme found another piece of pink Japanese fabric I had bought a while back.. and said it was pretty. I think it is just enough for a pair of pants. It is in the washer right now straightening out a little. For Valentine's day I bought Mark a pizza (a self-rising type he likes a lot) and a Valentine's balloon for Esme. It is still nearly inseparable from her. She takes it up and down the stairs and has had it in her hand when she went to sleep two nights in a row. We bought a cheap toaster the other day, so I wouldn't need to use the oven anymore. Buttered toast is a 'reliable' food Esme will eat if it is on her plate, like chicken sticks, fish, applesauce, oranges, carrots and corn etc... The first thing Esme did the first morning before I made toast was climb up on her stepstool and put her hand in the toaster. YIPE - I told her that was usually hot and to NOT do that... this morning she touched the outside of the toaster after I made toast and looked shocked at me 'HOT!' Yea, hot - so hands off little one ;) She wasn't hurt at all but now regards the toaster as a special magical thing that has to be watched very closely. More sentences lately that sound more complete... 'this is a green ball', 'eat an orange please' etc etc.. She also likes to try to do the splits, spin in circles until she can't stand up etc.. normal two year old things. The other day she got a leash on a dog and was trying to drag her around by the neck - the poor dog was desperately in need of saving. While watching the Muppets the other day Esme said loud and clear 'That is the Chef.' Haha. Now she just needs to get the 'bork bork bork' part and she'll have it down pat. 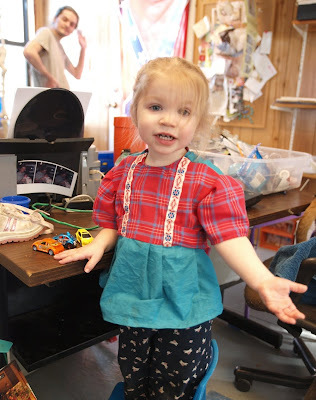 Esme was instrumental in carrying the pants fabric up from downstairs and putting it on the sewing room table. She has been non-stop today, always moving and doing something. 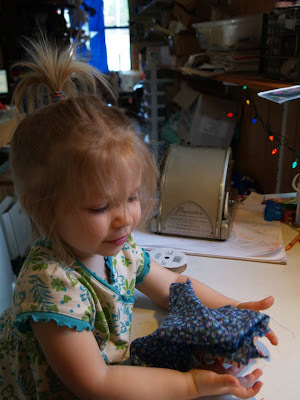 She put the pen cap on her finger and pretended that was a monster going to eat the fabric. Then the pen cap attacked the lines I had drawn on the fabric. I finally have the pants cut out and ready to sew, despite all the help and cute overload ;) The dinosaur also got to 'eat' the scraps of fabric after the fabric was cut. He now seems to be happily munching a pile of plastic pigs and sheep on the table. Esme is watching Shaun the Sheep while Mark cooks the pizza downstairs. I found a footed pajama pattern online and ordered it for 5.00 I am very curious to see how the pieces go together. It is rare because it had the picture of the pattern pieces and I still couldn't quite work out how they made up the feet with them.. I bought two new patterns off of Ebay (for cheap!) last week, which both seem in great condition and will help with some clothing for this coming fall. They are both size 5 (hard to find) and the one on the right is a real gem. 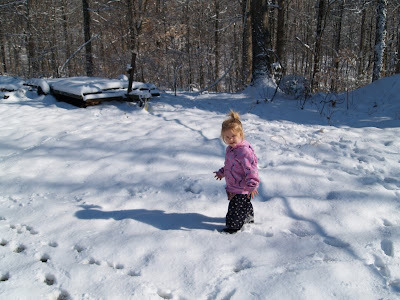 An outdoor 'swing' coat pattern and suspendered 'snow' pants! I researched the date and it is about 1951 (Simplicity 3754). The one on the left is probably early to mid 1960s (Simplicity 5137). The only thing left is a pair of regular pants in size 5. I have a plain pattern that should make up the gaps - and then I can make anything in that size I want to. Again, I'm a sewing geek. This is the sort of thing that makes me warm and fuzzy inside. She barely can wear the size 4s but I'm already getting 'set' for the next size up. 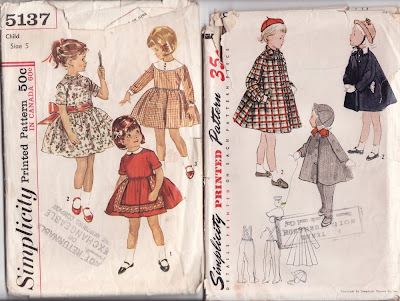 Even moreso, it is 'interesting' work - 1950s and 60s vintage children's clothing, patterns that expect the maker to know how to sew and do the finishing... It's a challenge and a real accomplishment to take good fabric and make structural clothing out of it. (structural as opposed to a t-shirt) *ok I'll stop now* but you get how much of a geek I really am about this. Esme has new odd food likes. She eats an orange every day, she has become so enamored of toast as a food type that we actually bought a toaster so I wouldn't have to make it in the oven anymore. And tonight she is eating miso soup with me again. She didn't want it at first. It has been a long time since I had bought any. Then she saw me continuing to eat it and agreed to try a bite. I lost the bowl to her. She drank nearly half of the soup I made for myself, and even ate bits of seaweed in it with relish. Mark says that is my half of the genes showing through. haha. The sizes never 'match' the age for toddler's clothing. This is just one of the general complaints I have about storebought clothing, besides the price and quality issues. Storebought pants and jeans never stay up over her rear end.. they ride down whenever she runs, which is most of the time. The necklines are never large enough for her head, unless I buy several sizes up, then she swims in the rest of it leg and arm wise. These are reasons I try to make a lot of her clothes now. I can't imagine what we're going to do when she gets school-age and it isn't 'fashionable' for mom to make her clothes anymore. Maybe her proportions will work out before then. Mother Nature sure likes to play tricks on us. It snowed last week, and then melted after a few days. Now it is back to Winter wonderland out there... except not so wonderful. It has made it hard to even think about going anywhere! Mark said part of the reason is that different tires are commonly used here in the South than was in Minnesota. In Minnesota it was 'standard' to run what he would call mud tires. I had those on my Dakota (not the one pictured) when I came down here six years ago. It was the only kind of tires I had ever used, and I know I didn't ask for anything special when I bought them in Minnesota. The ones on this Dakota are 'long wear' tires, meant for highway use. They have a shallower tread and really aren't good for much of anything in this weather. Go figure. 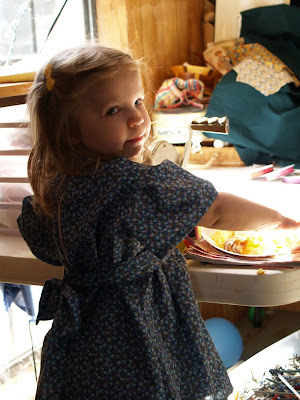 Here are a few pictures of Esme 'helping' make the dress earlier today. She pretended to draw around the pieces with a plastic stick, and hugged the pieces while telling them they were pretty. A sharp contrast to when I had it at Grandma's for a few minutes and she tried to put it in the garbage can along with the thread clippings! 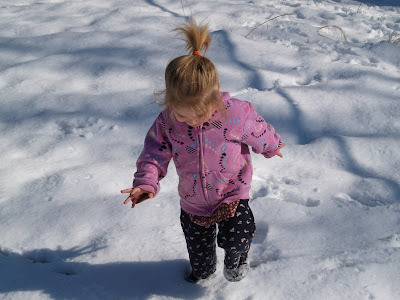 The trip to Grandma's house was unexpected - Esme demanded Daddy let her out on the porch, then wasn't certain if she wanted to go back inside or go to Grandma's by herself. I pulled on a jacket and put on shoes quickly (too quickly - as she ended up needing a diaper change once we were UP there) and we went for a visit. Also there are two pictures here showing what I mean about clipping the facings with a pinking shear before turning them - and sewing a little away from the turned edge to keep it flat later in the wash.
Now we're home from Grandma's and I'm having a hugfest in my lap while I try to type this. 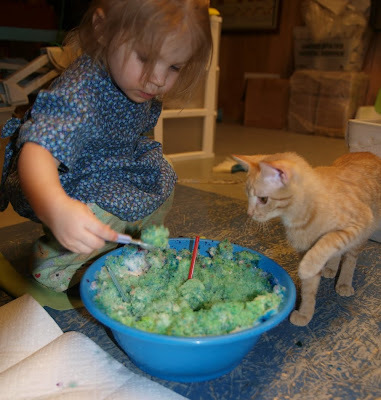 We've already swept the floor and cleaned up our toys, had crackers and juice and fed my Facebook cows. The dress still has some left to do on it but it will probably get done tomorrow. I forsee a short supper, a bath and some laundry done tonight. Then I'll run her around until an early bedtime - as I have to be up and at work at six am. On the table is the dress pattern from the red and turquoise dress. This is the fabric Esme picked out as 'pretty' to make the next dress from. I think Grandma gave it to us - it has been folded nicely in the pile waiting to be something for a while. Mark and I both broke out laughing. 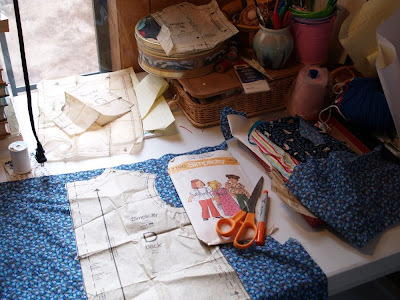 Working on the 4T dress. Esme is in her bed, because she wouldn't leave her hands and feet off the sewing machine and she's getting strong enough and tall enough that I can't just work over her head and keep her out of the way at the same time. I am using some vintage wide patterened ribbon a lady at work gave me to cover where the front ties attach. 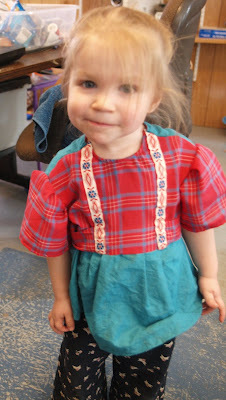 It kind of makes the dress remind me of lederhosen ;) But Esme agrees the colors are pretty and the ribbon is pretty. At the moment (after the timeout) I've gotten to the point where I need to sew the zipper in by hand and pin the sleeves in before sewing them on the machine. Then the hem will be finished and it will be ready for a try on. I'll try to add pictures of the steps if I make a second one soon. Step 1: Choose fabrics, cotton and prewashed. I had the turquoise leftover from a quilt project and the red plaid was a men's shirt from a rummage sale. Trace, cut and set aside all of the pieces necessary for the project. Step 2: I made the waistband ties and turned them inside-out. Step 3: Gathered the front skirt and pinned it to the front bodice. I actually don't really 'gather' but give a few pleats at equal distances from either side of the center - it works out better for me. Step 4: Pinned the waistband ties at the pattern marks and zig-zag sewed their ends in place near the center of the front bodice, just above the skirt. Step 5: Found some vintage ribbon in my collection that matched the colors well. Pinned it to the front of the bodice in vertical stripes that would secure and cover the zig-zag sewing of the waist ties underneath them. At the bottom of each ribbon I folded it up under itself about a half inch. I left another half-inch loose at the top that would be sewn into the facing seam and trimmed off. It would be possible to machine sew the ribbon into place, but I did hand-sewn stitches up each outer edge of each ribbon. I took an extra care to see that the flower pattern of the ribbon was in the same places on each side. Step 6: I made the facings for the front neck (2) and back neck (2). Pin and sew the facings to the bodice pieces. 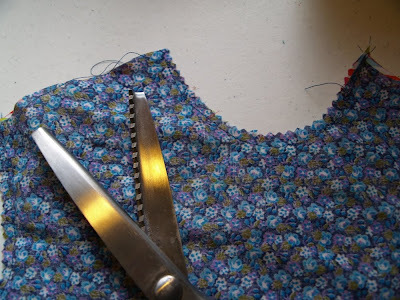 TIP: Use a pinking shear to clip extra fabric on the round parts of the facings before they are turned right-side out - it will help them turn smoothly. Once turned and pointed, sew the front bodice between the ribbon pieces to keep the neckline flat during washing. 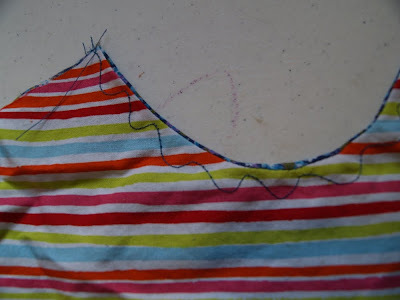 I also sewed a little decorative stitch at the back neckline top on each piece for the same reason. Step 7: Sew the front and back pieces together at the shoulders, right sides together. 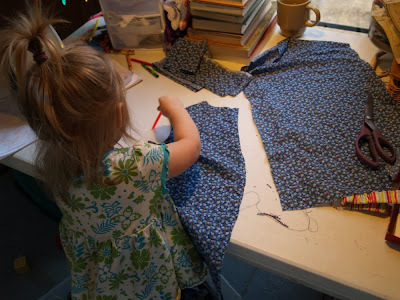 Sew the sides of the dress together from the armhole down. Zig-Zag over the edges of the side seams. Step 8: Pin in the zipper from the top down in the back of the dress. At the bottom of the zipper pin the back together and machine-sew down to the bottom of the skirt. If you have a zipper foot, sew the zipper into the dress. Again, this is a part I choose to do by hand. 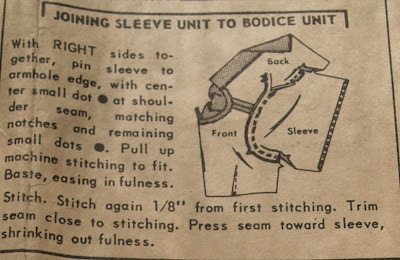 Step 10: Sew the sleeves into place with the machine. Leave a good seam allowance here. 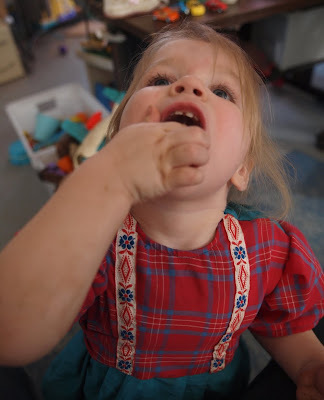 Armholes get pulled and tugged on all the time when dressing a toddler, this is one seam that shouldn't be skimped on! Zig-Zag around this seam as well afterwards. Step 11: Pin under and sew a quarter inch hem all the way around the bottom of the dress. Step 12: Check all seams, cut loose threads and you're DONE. Try it on and adjust if necessary. It's officially Tuesday now, but post a short update. The weather nearly defeated me four times in terms of driving this weekend...but with Mark's help and Grandpa and Grandma watching Esme for a few minutes (notably late at night) we got through the worst of it. 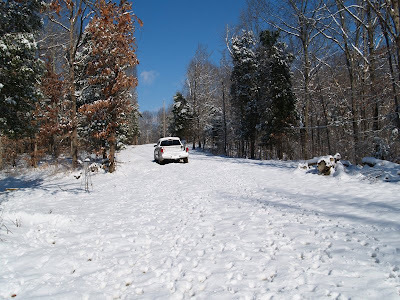 Today Mark braved the roads again to get donuts from Ne Ne's donuts in Paris, TN. They are excellent and this is the third time in three weeks we have been back. We also stopped at the meat store and the grocery store for a few items. Esme got a 'big' lollipop (thanks Daddy...) at the meat store. At home we have 'small' lollipops she can have once in a while if she is good. Usually all of these lollipops end up in the trash as soon as she tries to put it down on the floor, bed etc... but she is a good girl about throwing it away once I tell her it has become 'ew.' I don't know how we lucked out with that - but she believes me and reluctantly tosses it, cries for a minute and then bops on to the next thing. Once we were home Mark brought donuts on a paper plate to my desk. There were two donut holes for Esme and two halves of larger donuts for Mom and Dad. Esme grabs a large piece immediately and says 'I get BIG one.' She took my idle discussion of the size of the lollipop to heart - and she didn't want to settle for two 'small' donut holes or even a piece of a large donut half... silly. She is applying lots of adjectives better now - calling her cars by the right color name, saying things are empty, heavy, cute, wet, hot, hard, on 'tight', ew or mm etc... Lights are on or off, doors are open or closed. She identifies food on tables, in the fridge and asks for us a 'refill' or 'drinks downstairs' which means all of us to get our cups and go to the kitchen. For a while now she has made commentary on what she sees out windows and on tv.. but now it is more detailed and understandable. She tries to warn characters on her DVDs what is coming next - (fall down, something hit them) because they never seem to see it coming no matter how many times it happens (hehehe). Esme is napping now, and we are watching a movie. I should be working on her 4T size dress that was cut out last week. I haven't done much on it since. A few more pairs of pants are going to be in order again, too. She is starting to grow into the longer pants she has and her 3T dresses I made in November are showing a noticeable gap between the sleeve and her wrist that wasn't there before! There was a protest yesterday afternoon (2/01/2010) here in Paris, TN at the McDonalds on Mineral Wells Avenue. I couldn't find any news stories about it in Google. A lady customer had started the protest after feeling an employee had said a racist remark to her at the counter. The protest lasted for about an hour and people held signs in the parking lot. There were a lot of people at my workplace who had stopped and talked to them. I'll try to ask Elizabeth S. what the signs said, as I can no longer remember the exact wording. I wonder if there will be any updates in the news.